Water Quality of Golf Courses: What Does the Data Say? Posted in Uncategorized	| Comments Off on Water Quality of Golf Courses: What Does the Data Say? 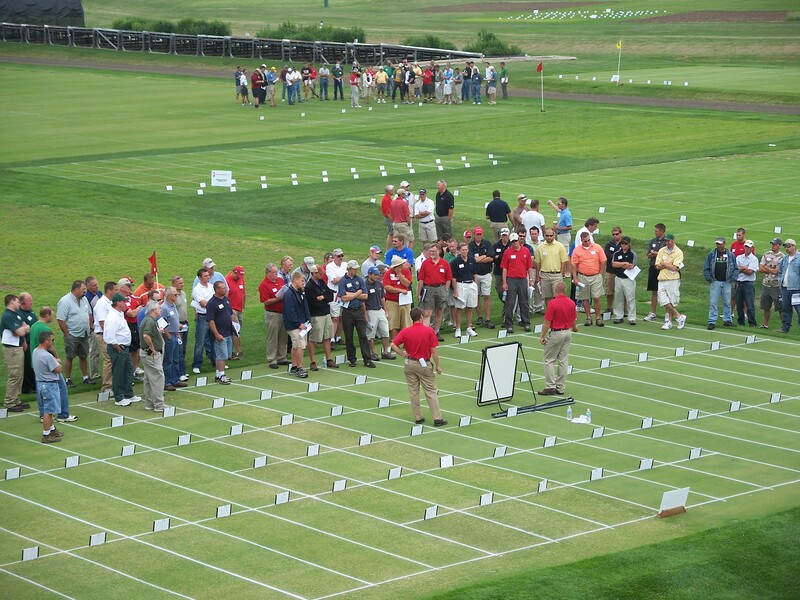 Registration for the 2019 Great Lakes School of Turfgrass Management is now open. This online program gives over 20 hours of instruction from experts around the region, and runs January through March. The content is geared toward the beginner looking for the fundamentals as well as the old pro looking for a refresher or the opportunity to learn a new trick or two. Please pass this information on to anyone you know who might benefit from this type of course. New this year, we are splitting the golf group off from the lawn/sports/parks/grounds group. The intent here is to give the golf group more customized information without bothering the general turf group with information that may not be relevant to those fields. Please see the registration forms below for more information. All questions can be directed to Sam Bauer (bauersam@gmail.com). Since 2014, Neil Radatz at Hawks Landing in Madison has been kind enough to let us play around with weed control strategies in native or non-mowed rough areas. We have received funding from the Wisconsin Golf Course Superintendents Association and the United States Golf Association for this work. We have three studies at Hawks, one looking at the implications of mowing and returning vs. mowing and removing vs. not mowing. Another study is evaluating various herbicide effectiveness, and the third is looking at using low rates of glyphosate to thin out really thick stands of grass and weeds. One of the challenges of having native areas is that if they are in play, golfers can spend a lot of time searching for balls. Ideally, balls would be easy to find and not too difficult to play out of. But many of the the areas can get overgrown and are difficult to walk through let alone play out of. We’ve found some good success with low rates of glyphosate (1 to 2 lbs AI per acre) applied in May. I am always nervous about recommending applying glyphosate to actively growing, desirable grass, but the last two years of data are suggesting that it may be an inexpensive tool to thin out native areas and keep play moving along. However, note that your soils and grass species/cultivars may vary in tolerance to glyphosate. Try it out on a small section first! The full report can be downloaded here (Weed control in native areas report 2016), but if you don’t have time to read it all, the Table below shows the efficacy of glyphosate applied to these thick areas in May where we found significantly greater levels of bare soil, resulting in better playability ratings. Also, the percentage of weeds in these plots were among the lowest of all treatments. It has been eight years since NR-151 took effect. Here are some documents and videos designed to help you update or create your nutrient management plan. 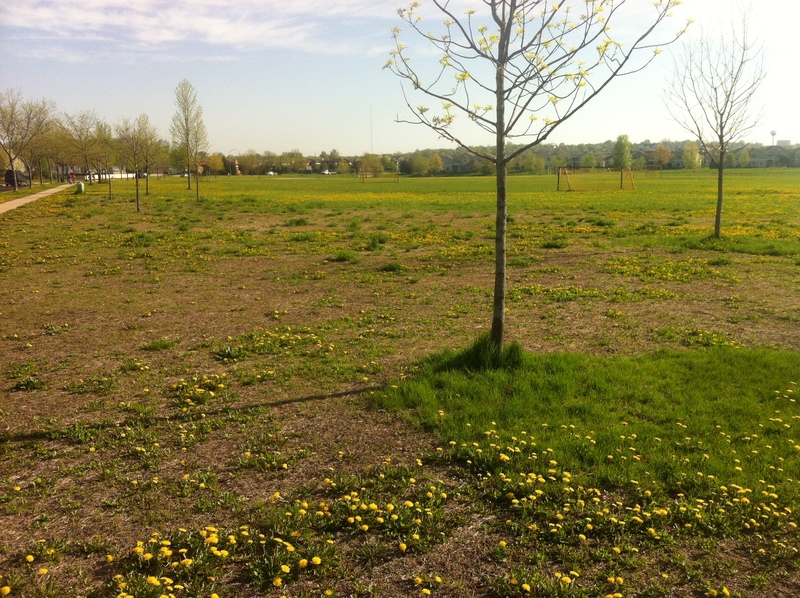 These plans are a requirement for all fertilized turfgrass areas of 5 acres or larger. Please email djsoldat@wisc.edu with any questions. Any investment in quality continuing education opportunities benefits employees and employers alike. 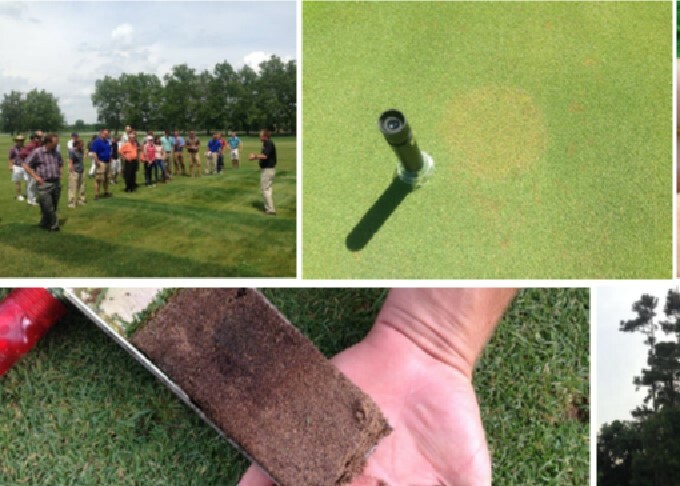 The 2016 Great Lakes School of Turfgrass Science Online is designed to help meet the continuing education needs of any individual or organization. This 12-week program will have training sessions accessible live online on Wednesday evenings from 6 to 8pm (Central Standard Time) or the option to view the recorded sessions. This 12-week certificate program aims to provide participants with thorough and practical continuing education in turfgrass management. 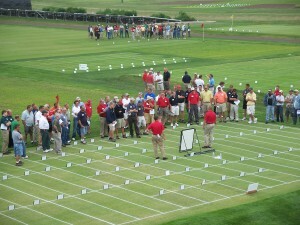 The course is directed by educators from the University of Minnesota-Twin Cites and the University of Wisconsin-Madison, with 12 turfgrass scientists and educators from eight Land-Grant Universities. Early registration is encouraged and pre-registration is required. For Further Information: Contact Sam Bauer, Assistant Extension Professor – University of Minnesota Email: sjbauer@umn.edu Phone: 763-767-3518. Professor Bill Kreuser at the University of Nebraska has recently updated the GDD tracker that he developed during his MS research here at UW. The new version is streamlined and gives the user the ability to choose their temperature units (Farenheight or Celcisu) and select from three growth regulators (trinexapac-ethyl, paclobutrazol, and prohexadione-Ca). Turfgrass herbicides safe for new seedings – Zac Reicher, University of Nebraska, gives a detailed summary of some new (and not so new) herbicide options for newly planted areas. With the drought abating in many parts of the state, we’ve seen lawns begin to green up. 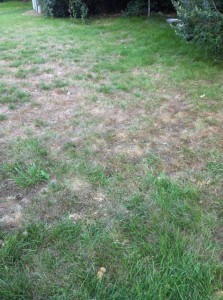 However, after the severe stretch of drought, nearly every lawn is expected to have some areas where the grass has died. These dead patches were likely undesirable species of grass, areas with very poor soil underneath, or weakened by another stress before or during the drought. Figure 1. Dead grass usually takes on a grayish black appearance and is very soft and “mushy” to the touch. Dead patches of grass take on a grayish, black coloration to the yellow or brown tissue and feel soft at the soil surface (Figure 1). Re-establishing some of these dead areas will be necessary in the fall. I recommend waiting until at least September 1st to begin the renovation process for a few reasons. First, Kentucky bluegrass has underground stems called rhizomes which can regenerate new plants. If you have a dead patch of lawn now, it is likely that the size of the dead area will be substantially smaller (or even gone) by September (Figures 2 and 3) as the bluegrass spreads to fill the voids. Second, September is the best time to establish new lawns from seed because the temperature and moisture stress is often lower and most weeds are no long germinating. Do not wait later than mid-September to begin renovation, as this may not be enough time for the seedlings to become strong enough to survive the winter. Sodding can be done successfully any time before the soil freezes. Figure 2. 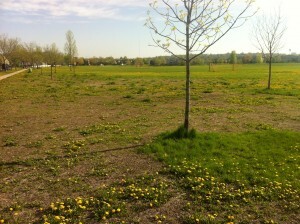 This large brown patch of grass is mostly dead, but there are many single plants of Kentucky bluegrass interspersed throughout it. Expansion of these small plant and expansion of surrounding Kentucky bluegrass into the dead area is expected to dramatically shrink the size of this area by September, although it is likely some of this area will need to be re-seeded or sodded. Kentucky bluegrass is the most common lawn grass in Wisconsin and an excellent choice for re-planting dead areas. 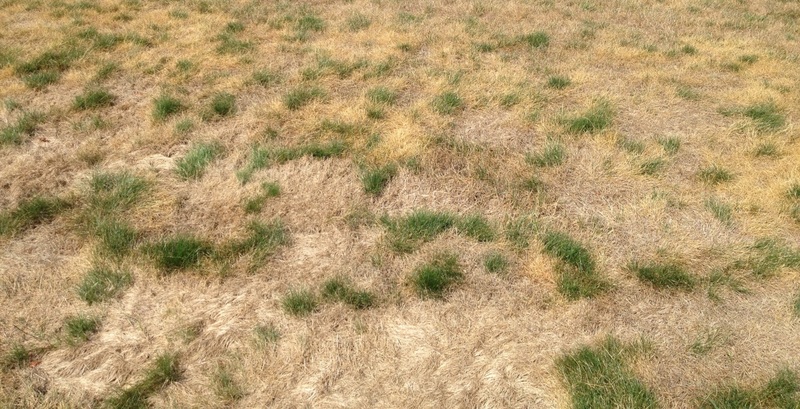 Kentucky bluegrass is likely the best option for drought tolerance. It will turn brown faster than most other species, but can remain alive in that state for up to 60 days. In addition, it has underground stems which have the potential to generate new grass plants and fill in dead spots. Kentucky bluegrass is fairly difficult to establish from seed because it takes up to three weeks to germinate. To avoid the chance of an unsuccessful establishment by seed, sodding is a great option. 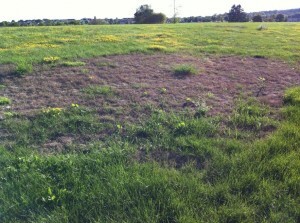 Tall fescue has potential to become a useful lawn grass in Wisconsin. It will not tolerate poorly drained areas where ice accumulates in the winter. However, it can retain a green color longer than any other lawn grass. 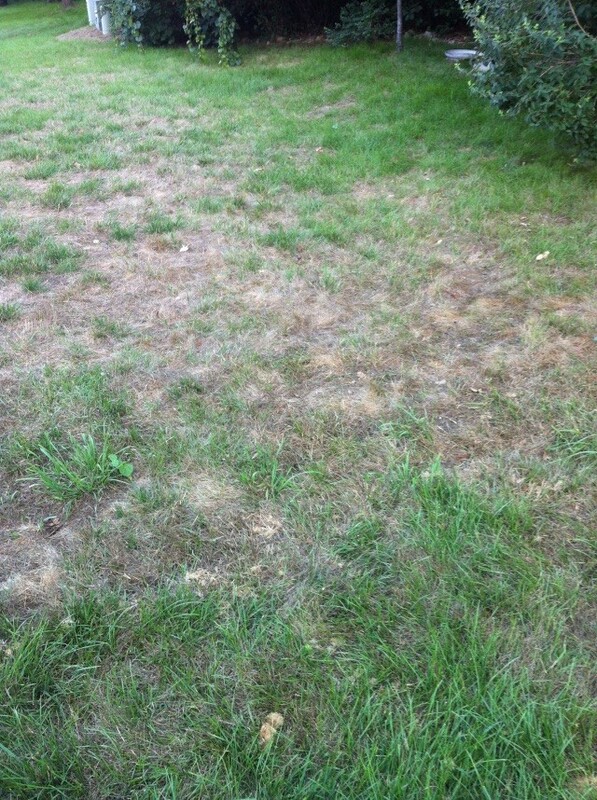 That said, when tall fescue loses its green color it does not have much time left and requires irrigation for survival. Another drawback of tall fescue its relatively wide leaf blade, which will look like a weed if planted in patches into an already established lawn. If tall fescue is desired, it should be planted or sodded across the entire lawn, and not used to fill in patches. 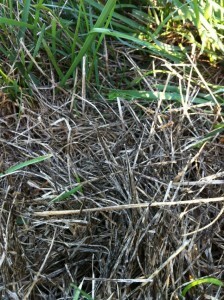 Fine fescue (including red fescue, hard fescue, sheeps fescue, and Chewings fescue) – these closely related species have a strong reputation for being drought tolerant, however, this grass has a tendency to form thatch, which results in the growing point (or crown) rising above the soil surface. 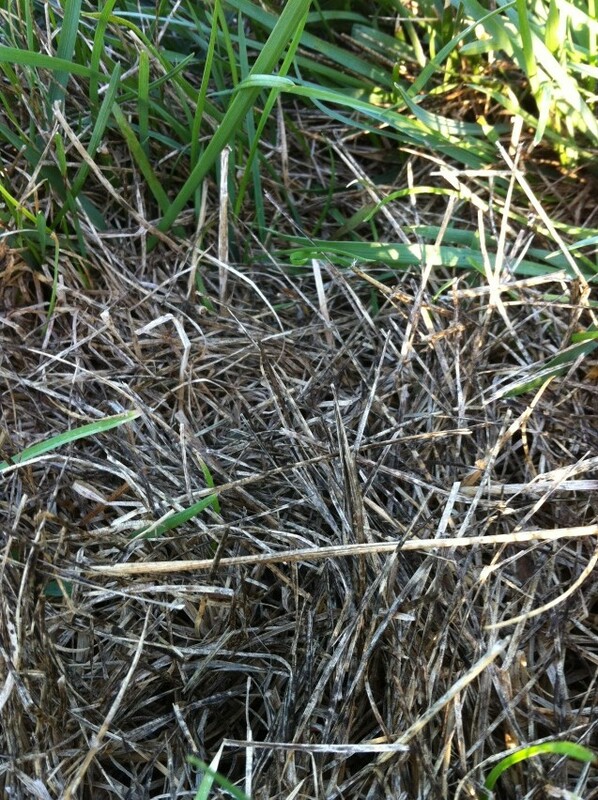 When this happens, fine fescue has a poor chance of surviving an extended period of dry weather. I have seen more dead fine fescue because of this year’s drought than any other turf type (Figures 3 and 4). Because of these observations, I do not recommend planting fine fescue in areas that were killed by the drought. This is a dramatic departure from previous recommendations, but based on things I have seen over the past few weeks. Fine fescue remains a good choice for turf professionals who can control and manage the thatch production associated with these grasses. It is also a good a good choice for heavily shaded sites. Figure 3. This lawn has a large amount of dead grass, most of which was fine fescue. The area that will need to be re-seeded or sodded is expected to be much smaller by September as the living grasses fill in. Perennial ryegrass is an almost ubiquitous component of many lawn seed blends. It has poor cold tolerance and not well adapted to drought conditions. It is included in mixtures because it germinates in less than a week and provides a fast green cover. I recommend avoiding planting perennial ryegrass or keeping it a minor component (<15%) of a seed blend. Annual ryegrass is another common component of (usually inexpensive) lawn seed mixtures. It is selected for its rapid establishment and vigorous growth. However, it has poor cold tolerance. Do not plant annual ryegrass, as it is unlikely to survive the winter. Seed or sod? Seeding will cost less, but has a smaller success rate and takes a great deal more labor and care for success. If you have time (up to four weeks) and ability to care for newly seeded grass, purchasing seed is the way to go. If your time and ability are limited, sod is a great choice. Sod can be placed anytime when the ground is not frozen. However, regardless of renovation method, proper soil preparation is key. Check out Lawn Establishment and Renovation (UWEX Publication A3434) at the UW-Extension Learning Store for information on how to increase the chances of a successful lawn renovation. Figure 4. Of all the turf types, fine fescue surprised me the most with its poor survivability. Fine fescues are considered more drought tolerant than Kentucky bluegrass in all the textbooks. However, the majority of non-irrigated fine fescue areas I’ve seen are dead. If fine fescue is planted along with Kentucky bluegrass, this is not a major issue as the bluegrass will fill in; but major renovation will be required of areas where fine fescues were the only species. I’ve noticed the areas where fine fescue has survived are those where no thatch exists and the crowns are underneath the soil surface. Because fine fescues have a tendency to form thatch, these grasses should not be planted unless thatch can be prevented – which is not an easy task for a non-professional turf manager. This lawn will likely need to be completely renovated because the living grass is not Kentucky bluegrass and will not fill in the vacancies left by the dead grass. Weed control and fertilizationin September and early October will be key practices to speed and encourage the recovery of your lawn (Figure 5). Fertilizing and controlling weeds in the heat of the summer can sometime cause even more damage, so make sure you wait until cooler conditions arrive when the grass is under less stress. Figure 5. Unfortunately, weeds can also fill in the voids where grass has been killed. In this case, the grass did not survive the drought because of the shallow, rocky soil from the construction of the road and sidewalk. Note the vigorously growing crabgrass near the mailbox. 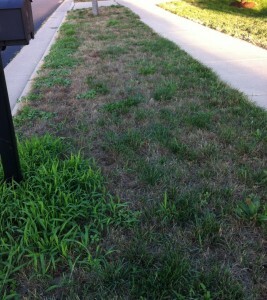 The lawn on the house side of the sidewalk (where the soil is better) is in good shape. 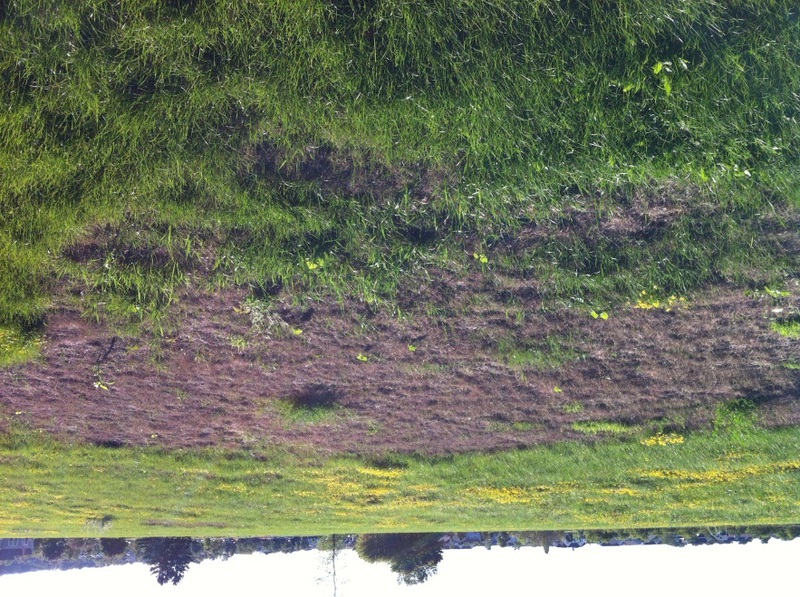 Weed control will be a key factor in helping the living grass bounce back and fill in the majority of this area. In this case, renovation may not be required aside from controlling the weeds and fertilizing in September and possibly October to encourage the living Kentucky bluegrass to fill in. Some lawn care providers use slow release forms of fertilizers that are appropriate for application in hot weather, but consumer fertilizers will work best when applied in September and October. For more information on best practices for lawn maintenance, check out Lawn Maintenance (UWEX Publication A3435) in the Learning Store. When in true dormancy, can take up to two weeks to green back up, but grass that wasn’t completely dormant will green up in a few days. There was an almost audible collective sigh of relief from around Wisconsin when some us finally received rain last week. It was a long time coming. I lived through the hot and dry years of 1976 and 1988 and can remember working full days for weeks on end, to the point of not being certain whether it was Tuesday or Saturday. The growing season of 2012 could potentially be worse than either ’76 or ’88. Our WTA Field Day is July 31, just a week away. Sometimes the best thing to do for yourself during a stressful period is to get away from the ranch and spend at least part of the day with friends who are going through what you are. Sharing experiences, problems and even war stories can put things in perspective and maybe make you feel a little better about your own situation. The faculty have tailored their presentations to the season at hand, so there will be lots to learn. They will also be around to answer questions and give some help. Until then, let’s pray for some rain and a few days of normal temperatures. We’d all feel better.